Most bakers, even the occasional ones, have most likely made banana bread at least once. It’s a simple thing to whip up, it’s delicious, and it’s a good use of very ripe bananas. The problem, at least to me, is that I get a little bored with it. I am always looking for variations to make it a tad different and more interesting. This recipe, from my beloved Southern Living, offers a definite twist on the traditional. It’s banana bread without the bread. All the good parts of banana bread are put in a baking dish, topped with oat-y/pecan-y goodness and baked into a bubbly, warm, yummy creation. Top it with some ice cream, and suddenly banana bread is a beautiful dish suitable not just for snacking, but for serving after a meal as dessert. 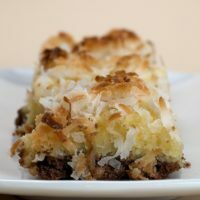 Some of the comments on the on-line recipe suggested the addition of coconut on top of the bananas. That’s definitely an intriguing idea I must try some time. 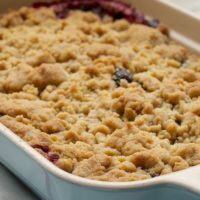 One of the best things about this cobbler is how amazingly easy it is to make. Measure a few things, slice a few bananas, stir a couple of times, and it’s ready for the oven. For the work that goes into it, you get an incredibly good return on your time/effort investment. And, of course, being at least distantly related to banana bread, this dessert has the benefit of being completely appropriate for breakfast. Well, maybe minus the ice cream. Visit the Recipe Index for more banana recipes! Turn the flavors of banana bread into a delicious dessert. Just top with ice cream! Stir together the brown sugar, flour, and butter until crumbly. Stir in the oats and pecans. Set aside. Whisk together the flour, sugar, and milk just until blended. Whisk in the melted butter. Pour into the prepared pan. 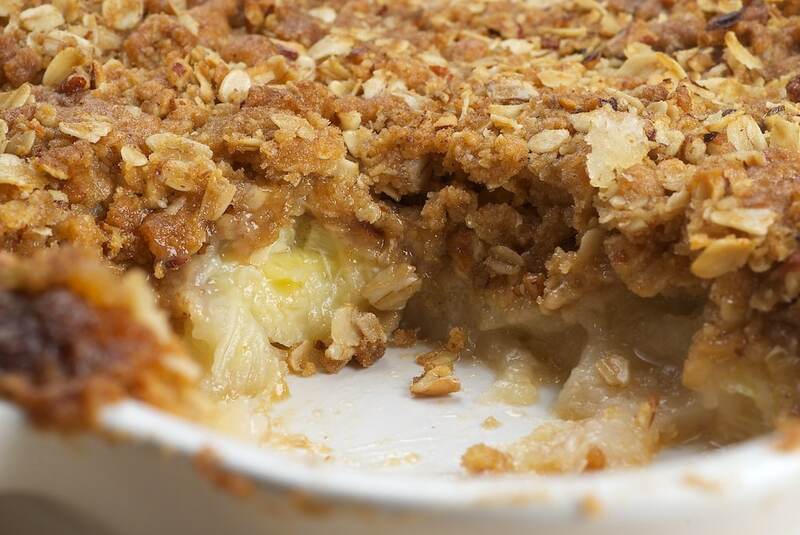 Top with banana slices and the streusel topping. Bake for 40-45 minutes or until brown and bubbly. *Most any baking pan with a 2-quart capacity will work. 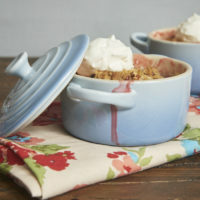 The one shown in the photos is this Le Creuset stoneware dish. I always have extra bananas lying around. Great recipe. Thanks! I was hoping we would hear from you now that you’ve regained your day off. I’ll look to hear from you on Wednesdays. I don’t like banana bread because I don’t like the taste of ripe bananas. However, I love texture so the topping on this is tempting enough for me to try it with fresh bananas. goodness this looks deliciouuuuuussssss!!!!!!!!!!!!!!!! I love banana anything! This looks delicious! I love bananas, but unfortunately my boyfriend hates them. I doubt I could eat the whole thing myself. Does it still taste good the next day? Say if I wanted to bring leftovers to work? This sounds like an absolute dream. Yum! I love everything banana! What a great idea. This looks fabulous, glad to see a post from you. Where was this last week, when I was buried in overripe bananas? 🙂 Kidding. I love this! I froze aforementioned bananas, so now I shall make this dish with them! This looks epic! And so unique–I’m a huge fan of banana bread, but changing things up once in a while certainly can’t hurt. Jessie, it reheats wonderfully. We enjoyed it for a couple of days after I made it. This is such a great variation!! Bookmarked! Wow it really does look easy. That’s kind of a surprise. Taking up this recipe this coming weekend. I’ll let you know how it goes. Thanks for the post. Ahhh if I only saw this 2 weeks ago. I was searching everywhere to find a decent banana crisp, but none were very good, this looks great! OOOH, I am deifnitely loving this non-banana bread banana bread! Sometimes banana bread, while delicious, just lacks that little somethin’somethin’ so this is right up my alley! Dressed to the nines banana bread! I got hungry just looking at it. 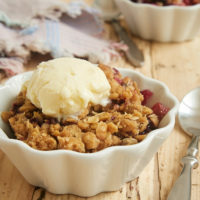 Ok, it’s not hunger, it’s a craving, but still going to make this cobbler. With some ice cream, of course. And maybe even some chocolate sauce. I’ve made banana bread before. It was okay, but I’m not a huge fan of the smell of bananas. This could be a recipe to try though. Oooh wow this would be perfect for leftover bananas..which i always seem to have! Looks delicious! You called this a cobbler but I think it’s really a crisp. 🙂 I actually made one last year and it was a HUGE hit with the family. Either way, whatever name it’s called it’s wonderful! We adore bananas! Thanks for the reminder that it’s been awhile. I made this from Southern Living and my husband LOVED it. It was soo easy and tasted great with some ice cream. Its been added to my recipe collection for those days when I just have to get rid of the bananas on the counter. I made your banana cobbler! It was amazing!! It is one of the best desserts I have ever had. I did change s few things though. Wonderful recipe. Can you use all-purpose flour instead of self-rising flour that it calls for in the recipe? It looks delicious! Angela, Jeff beat me to telling you how to substitute all-purpose flour for self-rising. Or, take Angela’s advice and just interchange them without the addition of baking soda and salt. For something like this, I think either way is fine. Enjoy! Vicky, I think a cake tin would be fine. Most anything roughly the same size the recipe suggests should work. Angela I used all purpose white flour when I made it, and it turned out very well. This recipe is amazing. I’ll never make another loaf of banana bread again. By the way, self-rising flour is really easy to make — 1 1/4 tsp baking soda and 1/2 tsp salt per cup of AP flour. This looks absolutely divine, and warm and gooey. 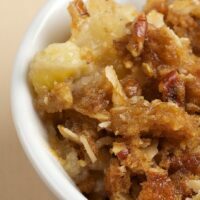 I love old style baked banana pudding. This looks just as good. Thanks for sharing this. I just happen to have some bananas I could use for this recipe! It looks really good. Yes. OMG Yes. Will be making it tomorrow! Thanks! 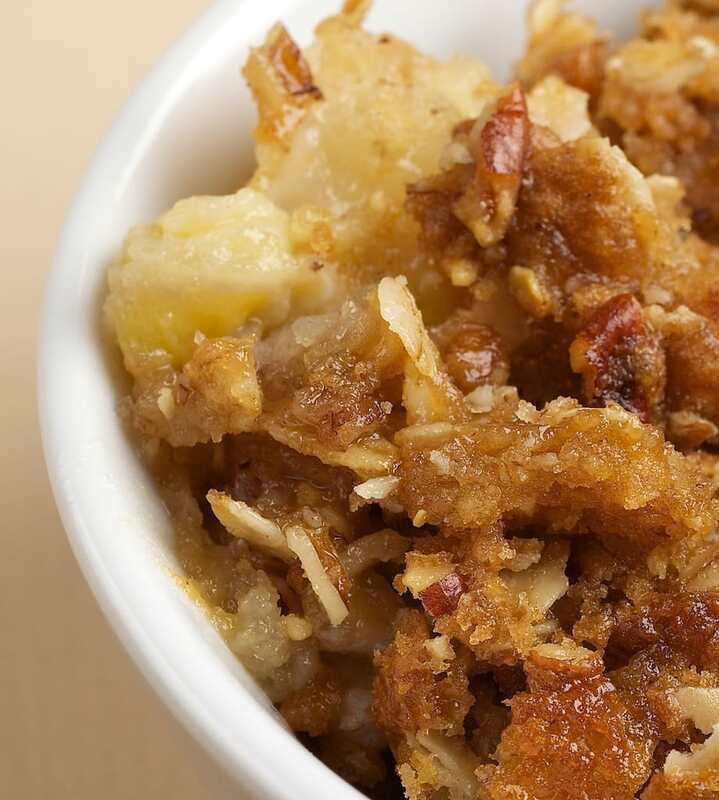 Bananas are such a good flavor star of a dish–this looks fabulous! Another great recipe for those ripe bananas. I’m always on the lookout for something other than banana bread. This looks delicious. I love this blog. It has so many authentic homey recipes! This is sinful! I might just have to whip it up, park my fanny in front of the tube and go to town! Made it last night. Loved it. Very good and very easy to make. Thanks for the recipe! I love that I could have dessert for breakfast. Looks delish! It is so true that banana bread gets boring this looks like a yummy recipe that I’ll be making next time I have ripe bananas. Thanks. Does anyone have any suggestions on adapting this for gluten free? I could try substituting gluten free all purpose flour. But I’m not sure what’s meant by “self rising flour”. Is that different that regular flour? Would the conversion be different than 1 to 1 for gluten free all purpose? Or should I substitute something different like tapioca flour? This was fabulous – thank you! I’m a preschool teacher and we were trying to figure out this morning what to do with all the overripe bananas in our snack cache. 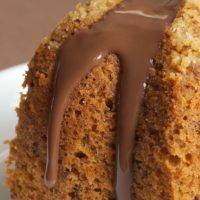 We decided to do a last minute baking project with the kids but had no eggs – and were so happy when we found this recipe! We had no oats and not enough butter for the topping, so used extra flour and cream cheese. It was easy and fun for the kids to make, and very tasty! Would it work the same if I used quick oats? Kelly, the only problem is that quick oats cook faster than regular oats. They can taste a bit different and have a different texture, too. If it were me, I would use quick oats if I didn’t have regular. In this recipe, it probably won’t make that much difference. Can anyone describe the texture of this to me? Thanks in advance! I made this today for a luncheon that I catered. It was fantastic !!! Followed recipe exactly as posted. I had several orders for it before I let the building ! That’s great, Daphne! I’m glad to hear it was a hit! I had to take a moment to let you know I made this recipe yesterday and it was fantastic! I was visiting my husband’s parents and they had bananas on their counter that needed to be used and asked me if I wouldn’t mind making something with them. 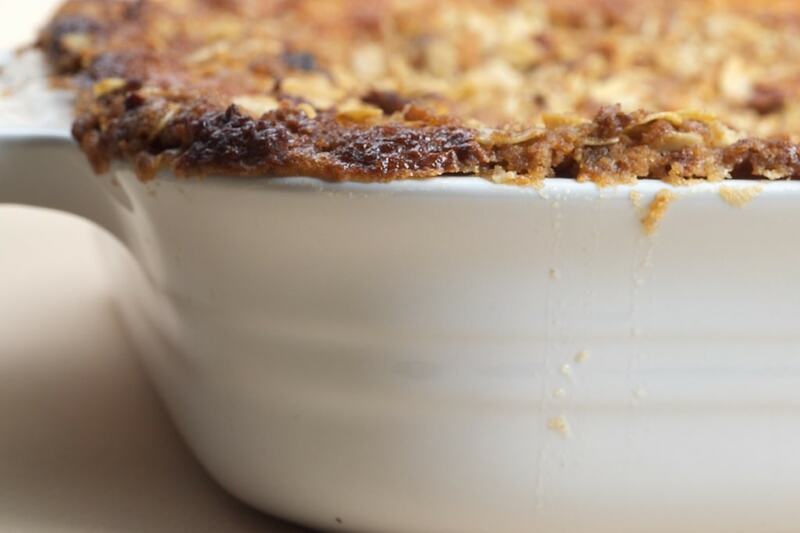 I didn’t want to bake a banana bread and I found your recipe for this cobbler. They (we) enjoyed it so much, I’ll definitely be making it again. Hi, Joanie! I’m so glad to hear that it was a hit! My family just DEVOURED this recipe. After reading others’ comments, I used cinnamon + nutmeg in the topping and added a dusting of coconut on top. Quick + easy to make + pairs well with an entire container of vanilla ice cream. Thanks for a great dessert – will definitely make again! I’m glad it was a hit, Leigh! This looks delicious and was easy to make. My husband and I were disappointed with the flavor. Pretty bland. I can see other people loved it. So happy I found this recipe! I don’t want to run to the store (again) and this recipe calls for ingredients I already have in the house! 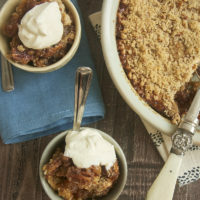 I made homemade vanilla ice cream which I think will pair wonderfully with this banana cobbler! Can’t wait to serve dessert to my family tonight! Hi, Tonya. I don’t use much Cool Whip or instant pudding, so I can’t speak from experience as to how that would work. If you try it, let me know how it works!